David Sedaris, in his “Letting Go” article in the New Yorker, once explained his relationship with smoking. He stated that on the day he quit, he left five cigarettes sitting in an airport in France. His friend asks him if he was going to leave them. He replied, I have hit my limit, I’m finished. He claimed that he had been given a certain number of cigarettes and he had his final one. 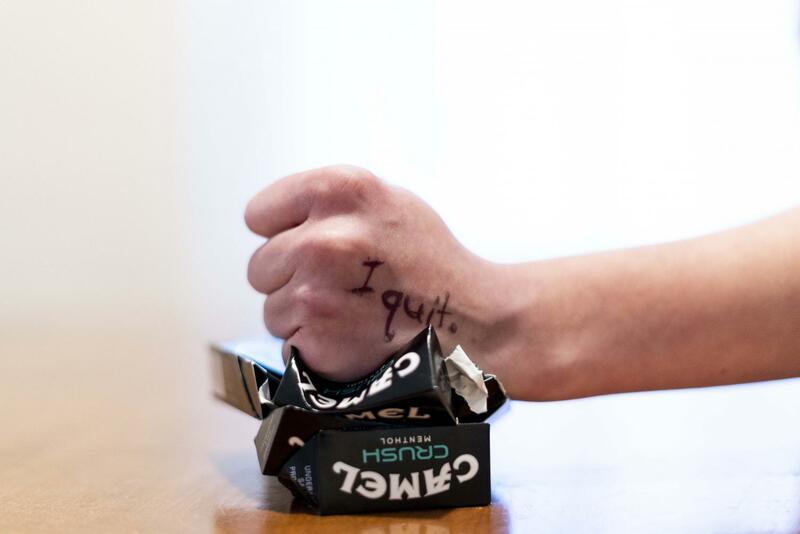 No one said quitting smoking would be easy. Nicotine is an addictive drug, which alters your brain chemistry. You could be one of the 1.3 million smokers who stop this year. You are not alone. Approximately 18 percent of college-age adults smoke. Over a million dollars are spent by the tobacco industry each hour in marketing; creating promotions to entice you to smoke. The risk of not quitting is detrimental to your health. Smoking cuts ten years off your life expectancy. It is the highest preventable cause of death, killing more than one-fifth of the population. More people die from smoking than car accidents, guns, alcohol, drugs, and HIV combined. Smoking affects every organ within your body. It also increases your risk for cancer, not just lung and throat cancer, but everywhere within your body. The average cost of a pack of cigarettes in Illinois is around $11.50. If you smoke a half-pack of cigarettes a day, that works out to be approximately $160 a month, or $2,000 a year. Even if you use the money you would have spent on cigarettes for the first year, and take a friend and sail to the Caribbean; you are going to save money in the long-haul. Being a smoker means that you pay more in the cost of insurance, and will have increased health expenses. There is no preset formula or magic pill to stop smoking. But, by understanding what smoking does for you and understanding what is preventing you from quitting, you can beat the smoking pitfalls and overcome nicotine’s hold on you. The first step is by deciding on a ‘quit day.’ Make your quit day as stress-free as possible. Decided you if you want to go ‘cold turkey’ or if you want to taper down the number of cigarettes slowly. Do you like the idea of a trial period for 12, 24, 72 hours before taking your last cigarette? There are many different techniques to help you stop smoking. One of the most common is the use of a nicotine replacement. The gum is available both with a prescription and over the counter. Talk to your doctor about different medications that can help with symptoms and cravings. Change your habit. Try and avoid any situation where you always smoke.To improve your chance of success, identify your emotional, habitual and social triggers. Understand how to manage them better. To prevent any slipping, have a plane for how you are going to deal with cravings. Before your quit day, make sure that you get rid of the smell of cigarettes, clean all of your clothing, and your car. Store straws located every place that you stored your cigarettes, keep sugar-free gum with you at all times. Most physical symptoms of nicotine withdrawal happen within the first week. These include a headache, feeling restless, difficulties sleeping, having a hard time concentrating and gaining weight. Each day that you are free of nicotine, the symptoms will lessen. Emotionally, overcoming smoking is going to take longer. Be prepared. Tell friends and family. Unfortunately, it often takes multiple attempts before people stop smoking. Every attempt to quit is going to be different. Stick with your decision. The more times that you attempt to quit, the higher the chance of your success. If you have previously tried, before, ask yourself, what went wrong and what can you do differently? Do not give up. This attempt could be the attempt that sticks. Have you hit your limit? Remember, deciding to stop smoking is a process. There are plenty of apps and motivational services to give your support. Additional information is available at smokefree.gov or through on-demand support by texting “CRAVE,” “MOOD,” or “SLIP” to 47848.